Migrant Canada Geese have really hit hard here in Wallingford this week. It seems a week or two early, but they are already here in force. What was meant to be a quick check of Mackenzie Reservoir late this morning turned into a 90-minute scan. There were 2-300 Canadas on the res when I arrived along with one continuing "Richardson's" CACKLING GOOSE that I first saw a few days ago. 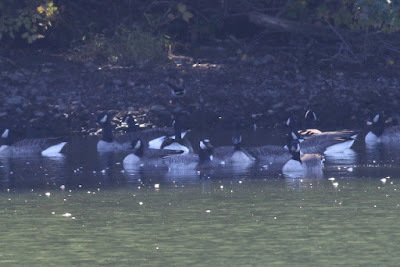 In this flock were Canada Geese of all body and bill sizes, including a few that in some ways seemed intermediate between Canada and Cackling Goose. This was reminiscent of last year's flock at this same location. 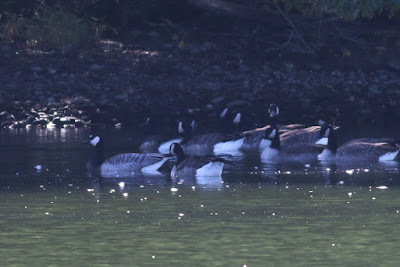 As I was about to move on I noticed a group of Canadas fly into the reservoir, followed by another and another...and so on. Before I knew it, there were 900 birds on the water. I did not notice anything different fly in, but obviously I missed something because a follow-up scan of the geese on the water revealed a hybrid BARNACLE x CANADA GOOSE. 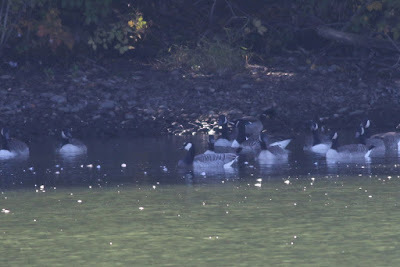 It was obvious at first that this bird was intermediate between a Barnacle and one of the white-cheeked geese (Canada or Cackling), but after some study I felt pretty good that Canada Goose was likely the other parent. This is based on the bird's body and bill size. A pure Barnacle Goose is smaller than a Canada Goose with a tiny little triangular bill. This bird's size was about equal to that of the adjacent Canada Geese, and its bill was a bit longer than that of your standard Barnacle. If the other parent were a Cackling Goose, one would expect a smaller-bodied bird with a stubbier bill.